First, make a smooth lumpless paste of corn flour & milk. Keep aside to use later. In a thick bottomed deep pan, boil the milk & keep stirring continuously. After the first boil, reduce heat & let it boil further till it is reduced to half the quantity. Add the condensed milk, sugar, fresh cream, salt & stir to combine well. Let it boil for another 5 mins. & then add the prepared & reserved corn flour paste & cook till it thickens. Take the pan off the heat & let it cool completely. Pour the cooled contents in a blender & pulse briefly to form a thick smooth paste which is called rabdi/basundi. 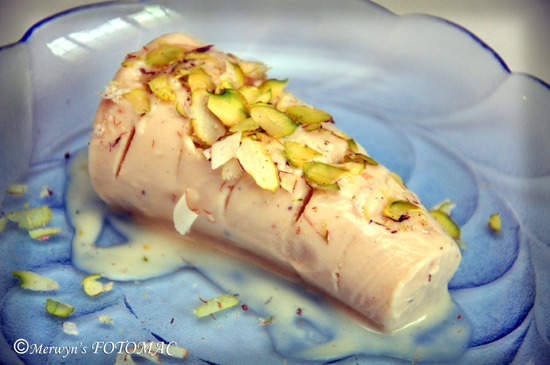 Pour out the rabdi/basundi in another pan & then add the cardamom pwd., nutmeg pwd., rose water & kewra. Stir to combine well. Reserve some of the rabdi/basundi for the topping & then fill in the aluminium kulfi cone moulds/popsicles/matkas/any container of your choice. Freeze for at least 8-12 hours or overnight. The kulfi has to be very firm. It is better to make it in advance to allow the flavors to meld/mingle. To unmould, dip the moulds briefly in water to loosen & scoop/ease out gently with a blunt knife on to serving plates. Serve topped with basundi & garnish with a generous helping of slivered almonds & pistachios. You may serve with falooda & rose syrup if you wish. Eat it quickly…. before it melts away!! !